Spanish exegete of the first half of the fourteenth century. 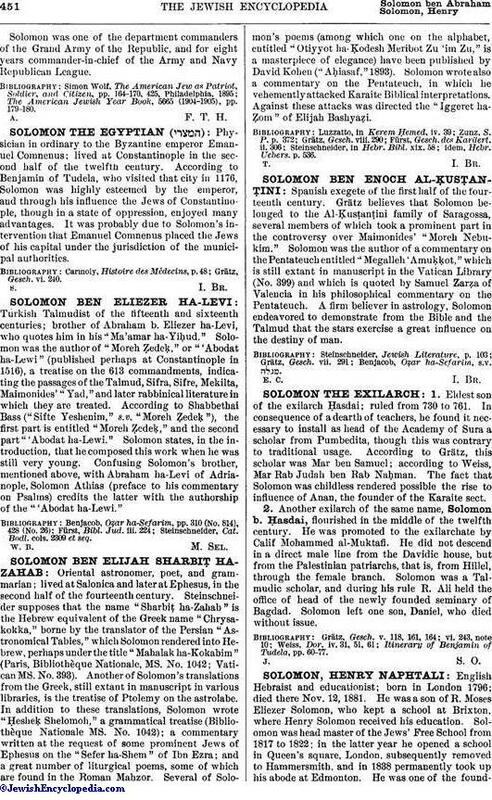 Grätz believes that Solomon belonged to the Al-Ḳusṭanṭini family of Saragossa, several members of which took a prominent part in the controversy over Maimonides' "Moreh Nebukim." Solomon was the author of a commentary on the Pentateuch entitled "Megalleh 'Amuḳḳot," which is still extant in manuscript in the Vatican Library (No. 399) and which is quoted by Samuel Ẓarẓa of Valencia in his philosophical commentary on the Pentateuch. A firm believer in astrology, Solomon endeavored to demonstrate from the Bible and the Talmud that the stars exercise a great influence on the destiny of man. Benjacob, Oẓar ha-Sefarim, s.v. .